Videos | Have YOU Ben Starr Struck? A picture is worth a thousand words. A moving picture, then, is worth… …I was never good at math. 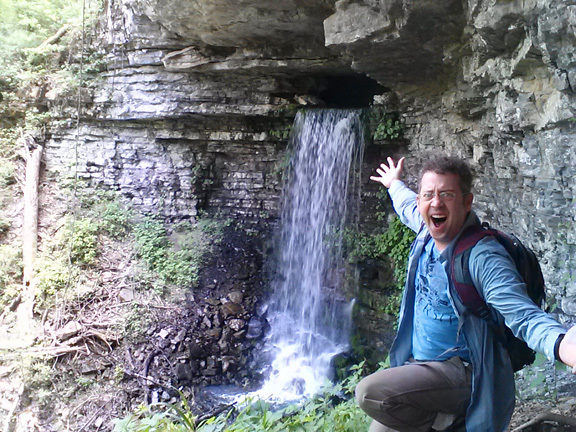 Big Creek Cave Falls…the EASY way! I’ve been exploring the Ozark Mountains of Arkansas since I was 19. There’s no place on earth like it…ancient mountains, thundering waterfalls, pristine rivers, deep and mysterious caves. After after 30 or so trips there, one might start to think that one had explored it all. But recently I became intrigued by an image I found on Google Earth…a photo of a cave with a waterfall pouring out of it. Now, this isn’t an unusual thing in the Ozarks. I’ve photographed and explored a number of caves with waterfalls pouring out of them. But I had never seen nor heard of this one. 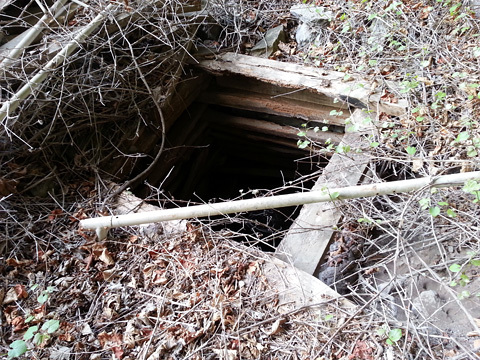 Moreover, it was in an area of the Ozark National Forest that had NO trails. This was up the Left Fork of Big Creek, a major tributary of the Buffalo National River, near its headwaters. And a bit of intensive internet digging found reference to “Big Creek Cave Falls” and mentioned that OTHER waterfall caves were to be found in the immediate area. No trails (ie, no people), wild country, caves with waterfalls pouring out of them…you don’t need to ask me twice! So I headed there the very next day. 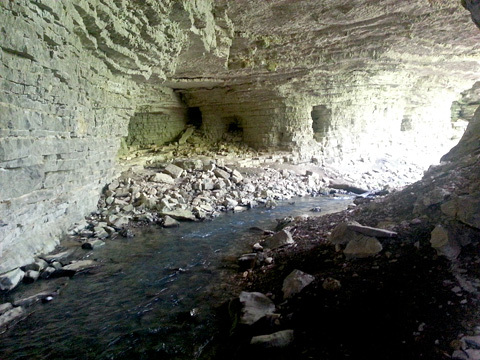 The few groups who’ve ventured into this area in modern times have been following a bushwhacking route up the west bank of the Left Fork of Big Creek, which is what I did to find the caves. It’s hairy travel, you basically swim through poison ivy and greenbriar for an hour, thrashing your way up the creek. But on the way back, I discovered an old, abandoned logging road on the EAST bank of the creek that whisked me back to my car in 15 minutes. I laughed so hard I almost choked. To access the trailhead, find the intersection of Arkansas Scenic 7 and Arkansas Highway 16, a few miles north of Nail, AR in the Ozark National Forest. Drive north on Hwy 7 for 1.3 miles, to a small dirt road on the right marked NC6840. (Google Maps and older maps show this road as CR 59.) 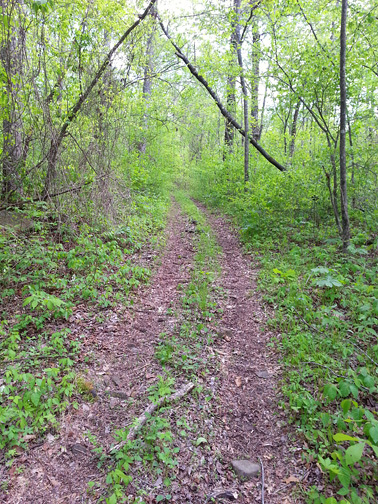 At first the road looks horrid, just 2 ruts, but give it a few hundred feet…once it passes private property and enters national forest land, it becomes driveable by ANY car. Zero your odometer at the turnoff and take it slow on the road, especially when it starts to plummet STEEPLY downhill. Drive 2.8 miles on dirt road, and you’ll see a single spot on the left side of the road to park, opposite a small dirt road that heads backward at an angle behind you to a locked metal gate. Park in the spot, and head up to the gate. There is an open entrance just to the right. This is national forest land, you are not trespassing. This is an old farmstead. Continue on the old road past the gate through signs of old farming. 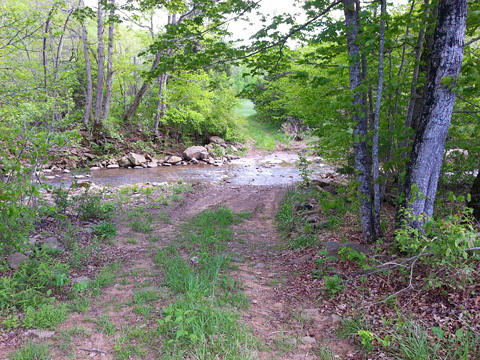 The road will take you down to the Right Fork of Big Creek, which you’ll have to wade. (I was there in wet season and made it across on stepping stones without getting my feet wet, but YOU MUST BE PREPARED TO GET YOUR FEET WET ON THIS HIKE.) Ford the creek and head up the opposite bank, and you’ll find yourself in a field. Turn left and head into the field past a small line of scraggly trees. The field opens up to stupendous views. The commonly described route tells you to head uphill and to the right, to the top of the field, where you enter the forest and begin your bushwhack. But you’re smarter than that! 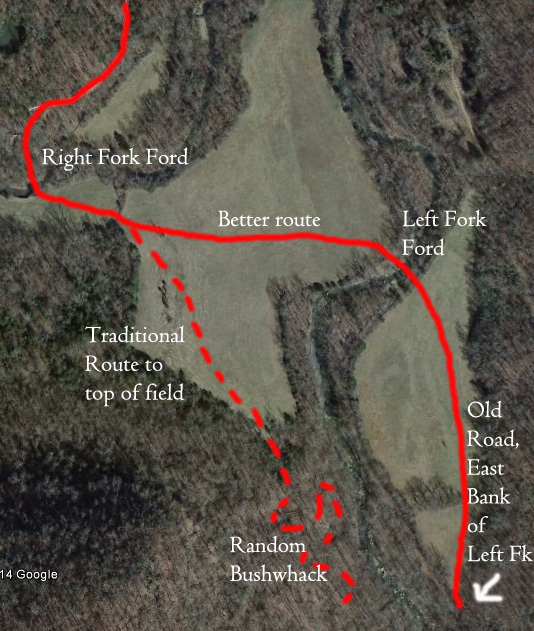 Instead, head to the left directly across the field, making for the hill that’s across the Left Fork of Big Creek. Soon you’ll come to a dim fork in the road where a rugged spur heads straight ahead and down toward the creek. Take this fork down to the creek and bushwhack downstream a bit to see some pretty waterfalls, giant boulders, and blue pools. Back at the fork, the main road turns left and heads up to yet another fork and an old cattle guard. The left fork turns back north toward the field. Instead, cross the cattle guard and continue hiking. Soon, you’ll ford a tiny stream coming in from the left. (Up this stream is a neat bluff area with a wet-weather waterfall.) Here the road forks again. The left fork curves around and heads straight uphill. Don’t take that. Instead, head to the right and the road will plunge down to the banks of Wolf Creek, which is what Big Creek is called here in its headwaters. You’re right in the middle of waterfall cave country here. Ford the creek here (you’re gonna get wet) and you have 2 choices. After fording, the road turns left up Wolf Creek, but instead, you head back downstream on Wolf Creek. In a few minutes, you’ll see a clear stream coming in from your left. 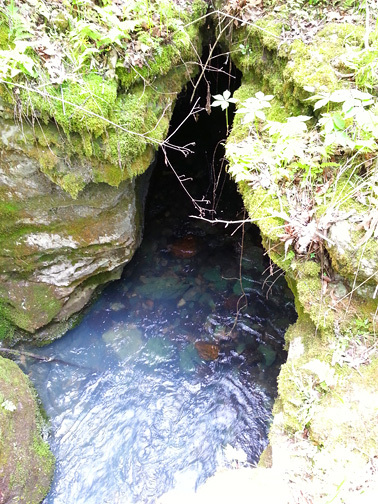 This is the spring branch from 2 waterfall caves. Head up the left bank of this stream and quickly you’ll come to a fork in the stream. The right fork heads up to what I’m calling Giant Cave, because it’s really massive. The left fork heads up to Big Creek Cave Falls. First, cross the left fork and head straight up the hill, toward what is obviously a gigantic cave in the bluff. 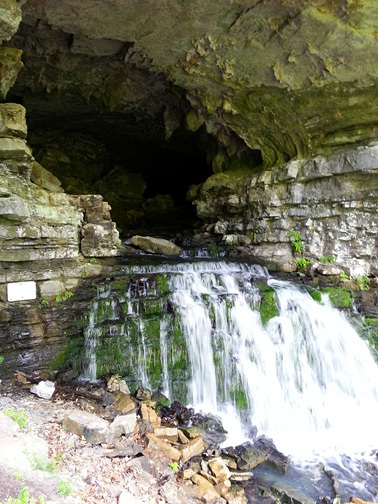 The creek roars out of this huge cave entrance, which is so big I couldn’t photograph it. 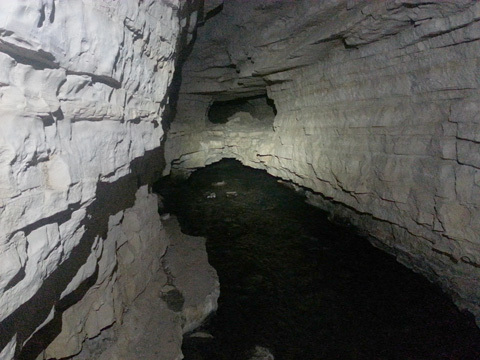 Inside the massive cave, the left-most passage is where the stream comes from. Explore it to your heart’s content, though you’ll probably get wet! There are other passages in the cave, as well, which you can cross the stream to explore. They will all require crawling, so be warned! 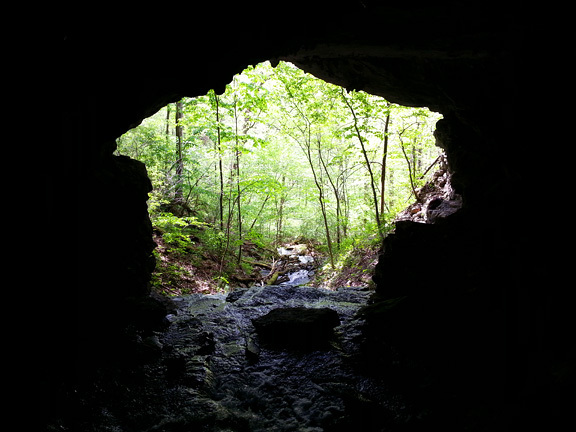 The view back out the cave entrance and down the cascading stream is mysteriously beautiful. When you’ve had enough of Giant Cave, head back out of the cave. 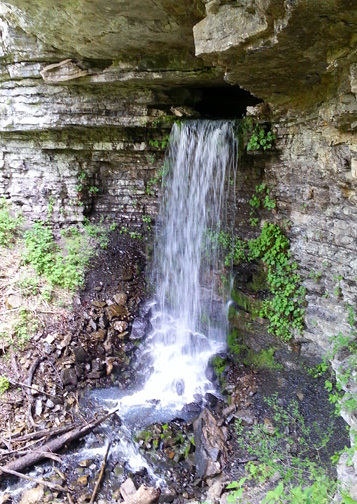 You have two options to get over to Big Creek Cave Falls, which is very close by. Scramble back down to where the two cave streams fork, and head right up the other fork. 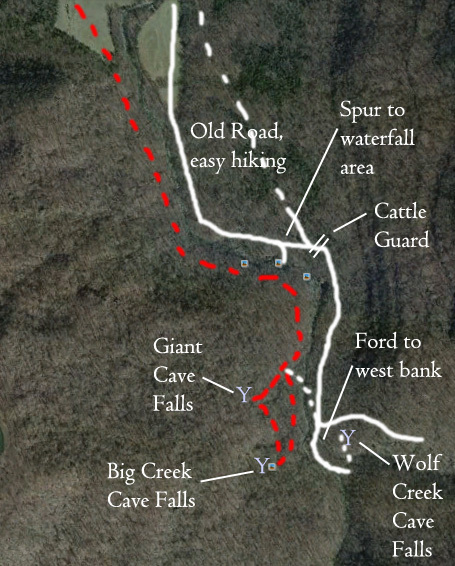 You can immediately climb back up toward the bluff line (or just follow the bluff line directly from Giant Cave) through poison ivy and greenbriar, then follow the bluff line to the left around to Big Creek Cave Falls. The easier route is to follow your instincts (and possibly a bit of flagging tape) up the hill to the LEFT of the stream. The cave entrance will come into view up to your right. There’s a little use trail that goes uphill and curves around, heading up to the left side of the falls, where you can reach the base. 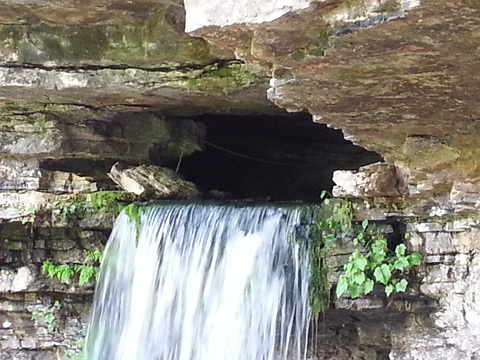 There’s a LOT of water coming out of this narrow cave entrance. And most of it disappears right into the rocks…only a trickle flows in the stream bed down to the join the stream from the other cave. In the inky depths of the cave entrance you can see a chain hanging, indicating someone climbed up there at some point, somehow, to explore. I wonder what they found? There’s no way to access the cave unless you’re comfortable lead-climbing up overhanging ledges with icy water spitting on you from the falls a few feet away. This is one to sit, ponder, and be stunned by. When you’re done, head back down the stream all the way to where it joins Wolf Creek to make Big Creek. Turn right and head upstream on Wolf Creek, and soon you’ll be back on that road you were hiking in on. It will peter out on the banks of Wolf Creek below a seemingly-impassable pool and cliff. Listen carefully. You’ll hear a deep roar, like an airplane, from a waterfall that seems to be up on the mountainside across the creek. But that much water would surely be visible as a stream entering Wolf Creek, right? This is an important cave. There was a gate (though no fence) and there’s a sign from the Nature Conservancy asking you not to explore the cave. 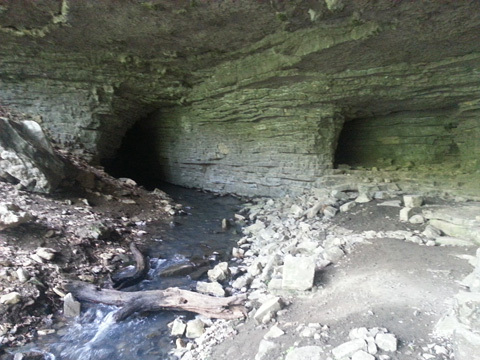 It is home to several species of bats, the most important of which is the highly endangered Indiana Gray Bat. Exploring the cave in winter may wake the bats from their hibernation, causing them to use up their fat reserves and placing them at risk of dying of starvation. Exploring the cave in summer may disturb mother bats from nursing their young, who may fall to the cave floor and die. Spring is the safest time to explore a bat cave because there’s plenty of insects for them to eat outside, and they haven’t given birth to their young yet. But there’s ANOTHER reason not to explore this cave at all. A mysterious bat disease is sweeping the country, called White Nose Syndrome. It causes white fungus to grow on the nose of the bat, and sores to open up on the bat’s wings. The disease itself doesn’t kill the bat, but it typically wakes the bat up during hibernation, causing it to starve. And why should YOU care about a bat disease? 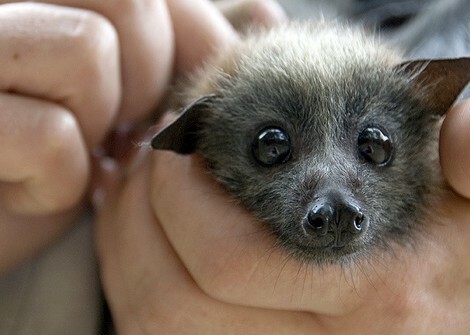 Because without bats, all humans would starve to death. Our relationship with bats is as important and symbiotic as our relationship with honey bees, that pollinate all the crops that we eat, and that we feed to our meat animals. Bats work on the other side of the equation (though some species are also important pollinators) by eradicating crop pests like grasshoppers. The bat population of a single cave can devour the equivalent of FORTY 18-wheelers full of insects IN A SINGLE NIGHT. From just one cave’s bat population. There’s not enough bug poison in the world to deal with the kind of insect swarms we’d be dealing with if the bats weren’t there to eat them. 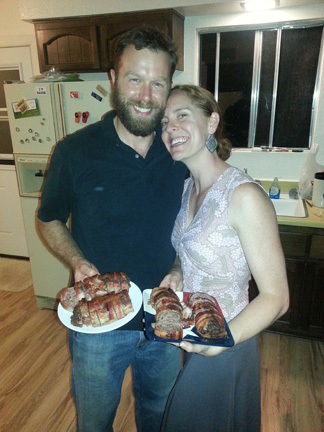 Organic farming would impossible. And the toxic sprays that would be necessary to keep pests off our crops would pollute our waters, killing many other species, and causing untold human health problems. So THAT’S why you should care about bats. They’re not evil, they don’t attack humans, they don’t live off human blood, and while they get a bad rap every once in awhile for being potential rabies carriers, dogs are responsible for FAR more animal-human rabies transmissions each year. And besides…they’re super cute! So the long and short of it is that, without bats, you die, your children die, all human life perishes. So don’t explore this cave beyond its entrance. And click here to find out how you can get involved in the business of helping ensure that we all stay alive by eradicating White Nose Syndrome before it’s too late. Feel free to comment below, especially if you have memories of exploring the Ozarks! And now it’s time…the main event. 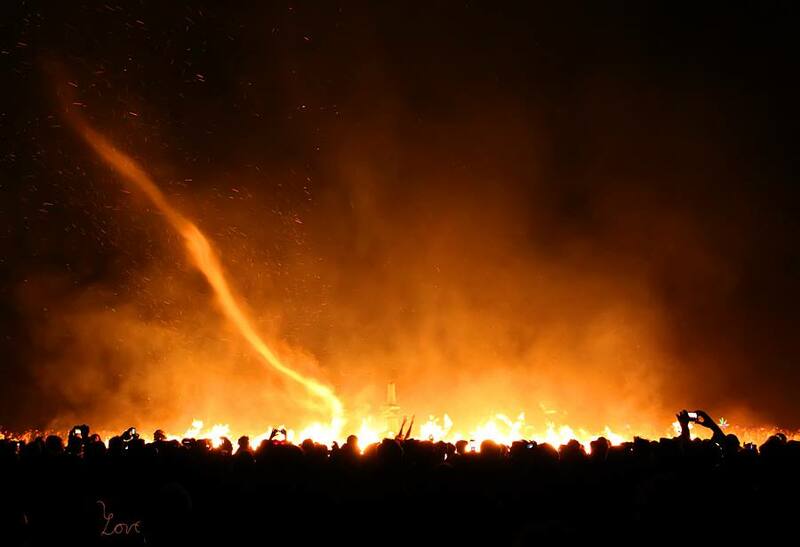 Burning Man. 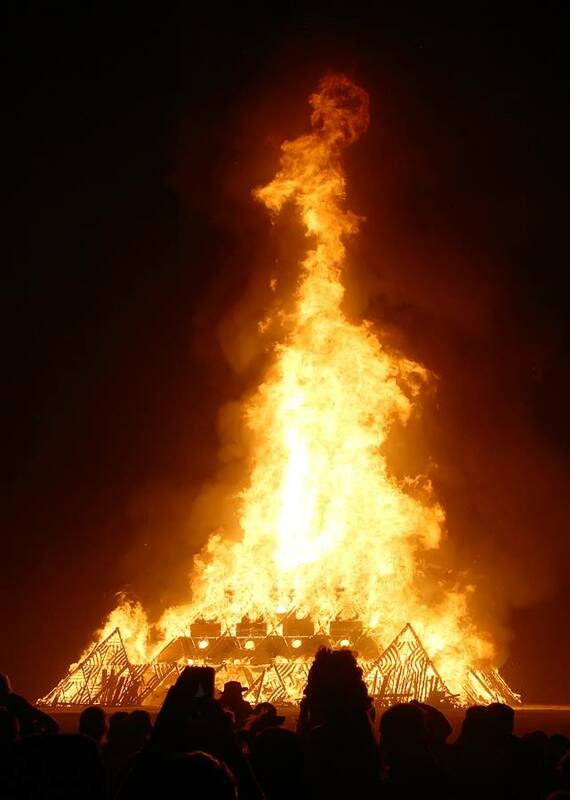 This was my 5th “Burn” and the more often I get asked, “What is Burning Man?” the more at a loss for words I am. When you ask that question to one of the 65,000+ “Burners,” you’ll get 65,000+ different answers. 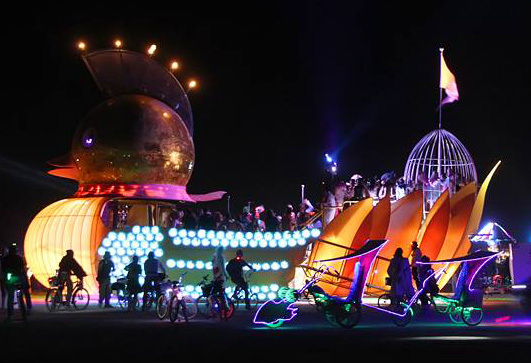 Theodor Seuss Geisel would have loved Burning Man, because it is a world unto itself, where adults become kids, and kids see a world that actually makes sense to them for the first time. 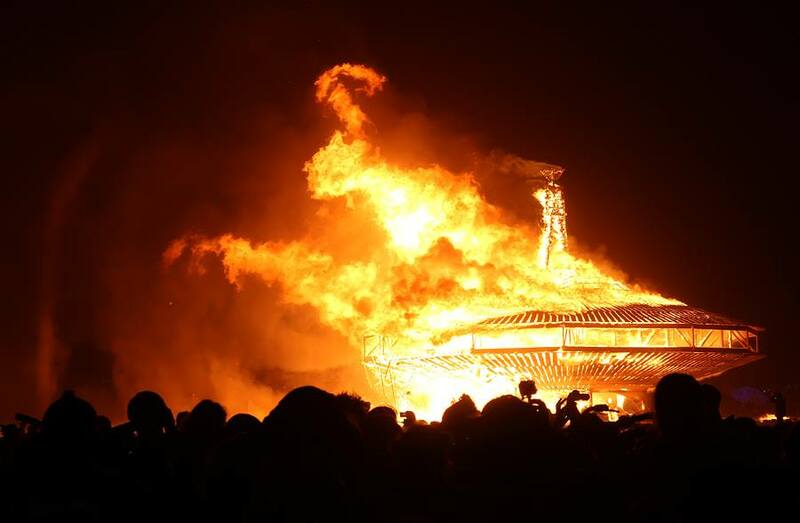 This post will be about Burning Man 2013 at large. 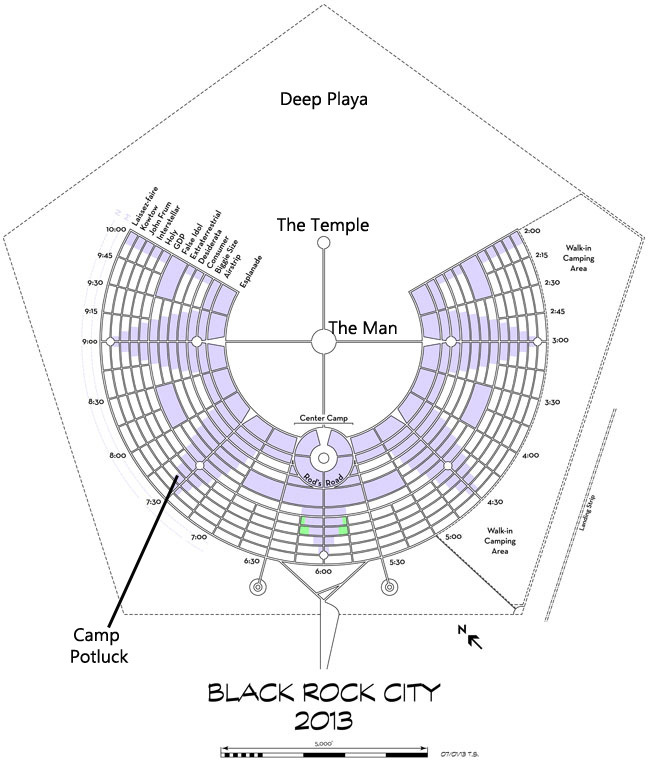 The next post will be specifically about my camp, Camp Potluck, and what we do to contribute to the Burning Man community. My partner came to Burning Man for the first time this year. He was nervous. *I* was nervous. He’s not a big camper. 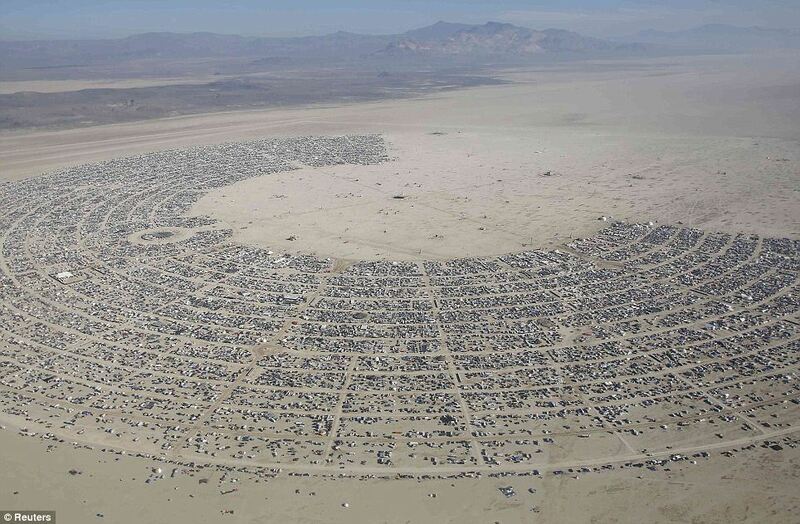 (Though camping at Burning Man is definitely luxurious camping.) He likes to stay clean. (We have a shower, but the event takes place in the dustiest place on Earth.) He likes to sleep at night. 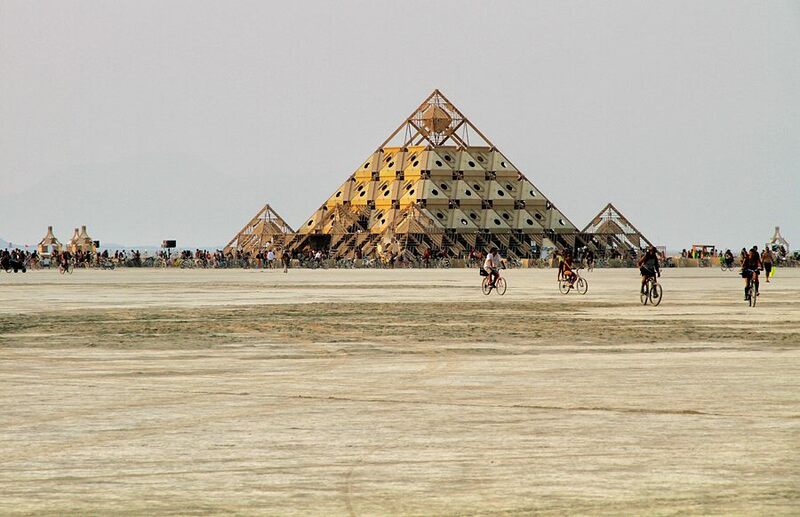 (Burning Man thunders 24 hours a day.) He’s not a huge people person. (People at Burning Man walk right into your camp, sit down, put their arm around you, and start talking like they’ve known you forever.) But I knew that the city, the people, and the art would be such a powerful inspiration for his photography that he just had to come. Within moments of his arrival, we struck out to explore the city and were immediately caught in a bee parade. What’s a bee parade, you ask? Why, a spontaneous parade of people and machines that look like bees. And a few other folks who think that sounds like fun and they’ll tag along, too, thank-you-very-much. Where are they headed? Who knows? Where did they come from? Also a bit of a mystery, because there’s a LOT of them. But it’s 6:47pm on Wednesday, August 28, and someone decided it was time for a bee parade. 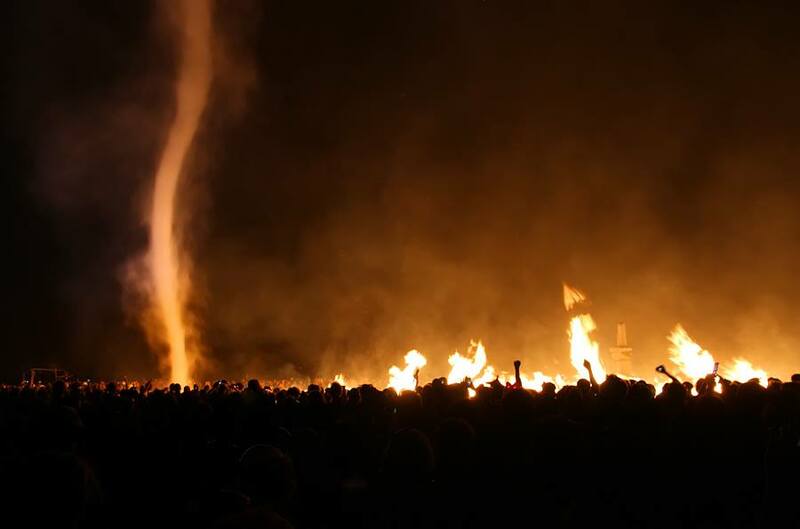 A perfect, incongruous, nonsensical, fantastic distillation of Burning Man. The city is laid out in an arc centering on “The Man,” a giant statue. The inner street, Esplanade, is just shy of 2 miles long from end-to-end. Each successive street gets longer, until the outer street, L or “Laissez-faire” (the street names change each year to correspond with the theme) is 4.25 miles long from end-to-end. So you’ve got a total of 12 residential streets, totaling over 35 miles…all packed with exciting theme camps, art, and activities to explore and enjoy. 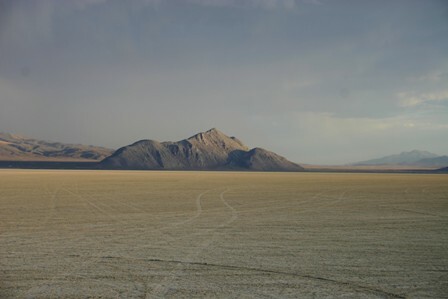 Combine this with the central open area around The Man, which is filled with art, and then the vast emptiness of “Deep Playa” where massive art installations live (along with rogue, spontaneous art), and you’ve got a city that’s far too large to see in a week. Then you’ve got a big fat schedule of events hosted by theme camps nearly 200 pages thick, and that’s not even a fraction of them. (The rest can be downloaded onto an app if you’d like to see them all.) And after 7 days…it’s over. And it’s never the same again the next year. So at some point you have to throw your hands up and just resolve yourself to experiencing what you stumble across, rather than trying to soak it all in. 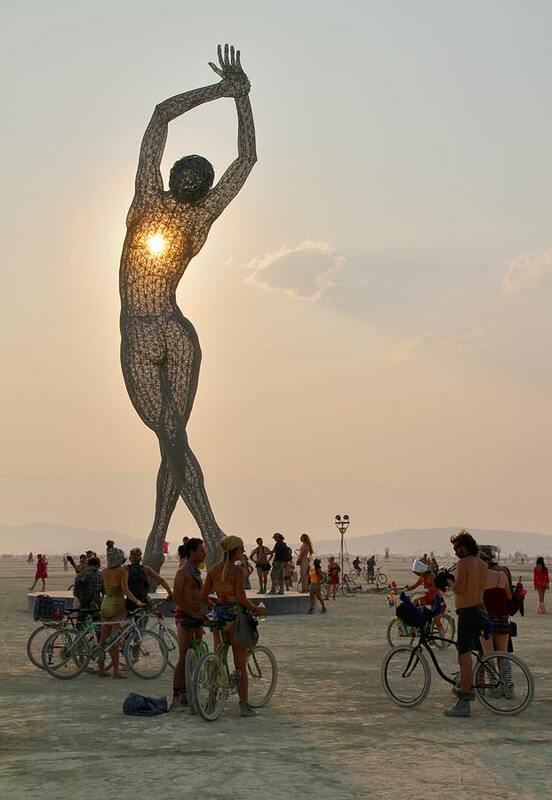 The art is the first thing that comes to mind when Burners think about Burning Man. Oh, the art! 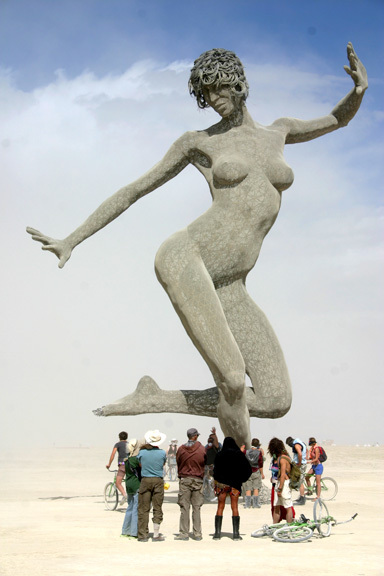 Burning Man is one of the largest contemporary art collections in the world, but only its participants get to experience it, for most of the art is burned to the ground during the event. Tragedy? So say some. But others see it as incredibly powerful that things of such potent beauty exist to be enjoyed only by a handful of appreciative, receptive eyes, and then vanish forever. 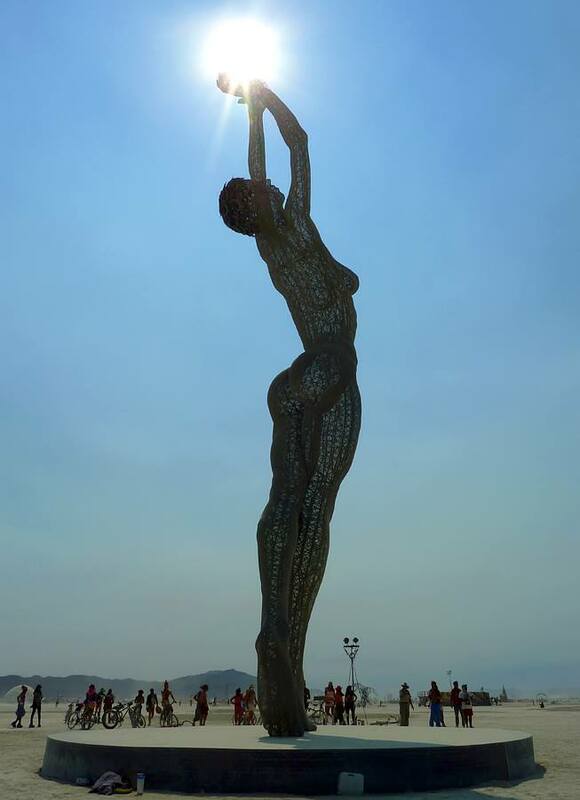 In 2010, I saw Bliss Dance far out on the horizon in Deep Playa. I knew nothing about it. I walked toward it for what seemed like hours, and it kept getting bigger and bigger. It was so graceful and smooth, and when I took the last few steps and finally stood under her outstretched foot, I saw that she was made of sharp metal bars, with coils of razor wire for her hair…she stared down at me from the bliss of her graceful, yet somehow desperate and furious dance…I sat down in the dust and wept. Never in all my travels have I seen a sculpture of such intense beauty. So massive. So often we experience a piece of art in a sole, singular moment. Lit by a glaring museum light, or the sun at high noon. 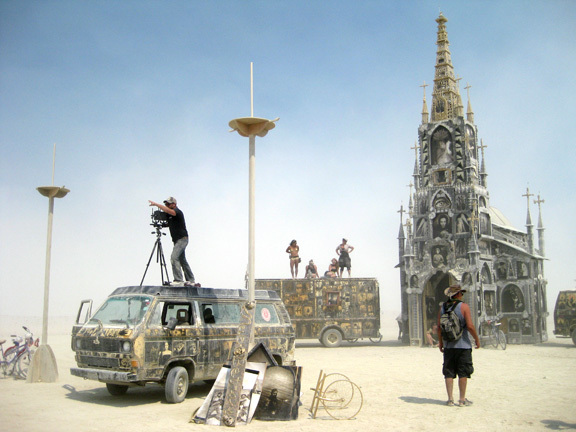 Burning Man gives you the chance to experience art you connect with at all moments of the day and night, in dust storms and after a sudden rain…at twilight, and in the dead of night with naught but frigid starlight faintly illuminating each nuance. Unafraid, I entered the church, and at the front next to the pulpit was an actual working organ, with scrolls of ageing sheet music spiraling out of it into the rafters and out the steeple. A girl dressed as a bunny rabbit was sitting at the organ, blaring out Dixieland jazz with flawless skill…at 3 in the morning. Remember the old game Plinko? 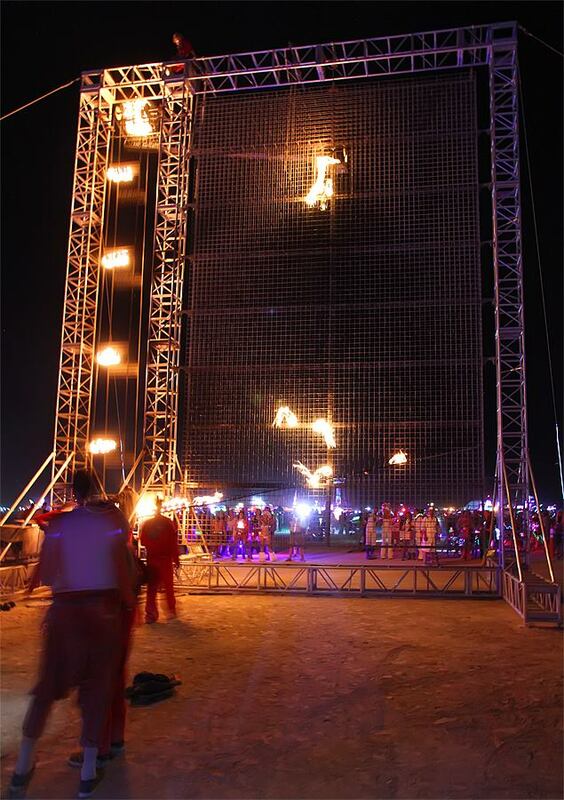 Some artist spent the year building a truly massive Plinko with flaming bowling balls that ride up an elevator on one side, dump into the grid, and plink…plink…ROAR…plink…downward to the bottom, where they roll back onto the elevator and head back up to do it all again. 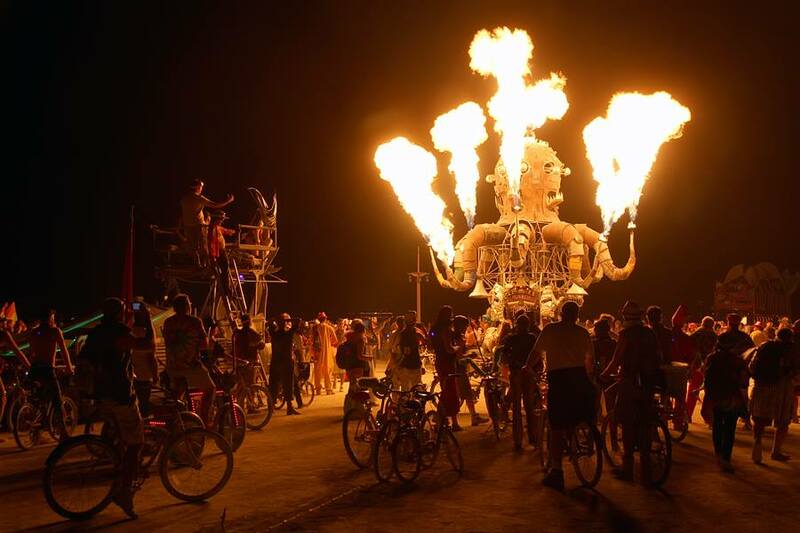 It took a team of 4 to keep this mammoth flaming installation running…and they did it all night…every night…just so Burners could stare, open-mouthed, in awe. Do they get paid for this? Quite the opposite. 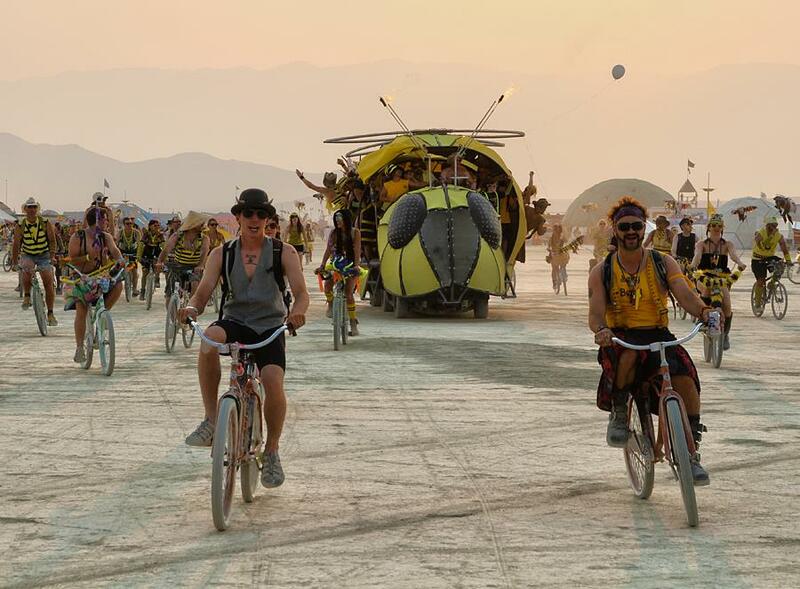 They probably went flat broke spending every personal dime all year long on this project…just to bring joy and inspiration to the Burning Man community. This is “El Pulpo Mechanico,” the mechanical steam-punk octopus, built by artist Duane Flatmo using no modern technology to drive the reticulated arms, mouth, and eyes…only old-fashioned gears and bicycle chains. El Pulpo sits on a chariot that moves about the playa each night, spouting fire, scaring the ever-loving-crap out of Burners already stunned and overloaded with the spectacle of the city. Again…who gets paid to create these wonders? Nobody. The cost to produce this duck dance bar nearly hit the $200,000 mark. 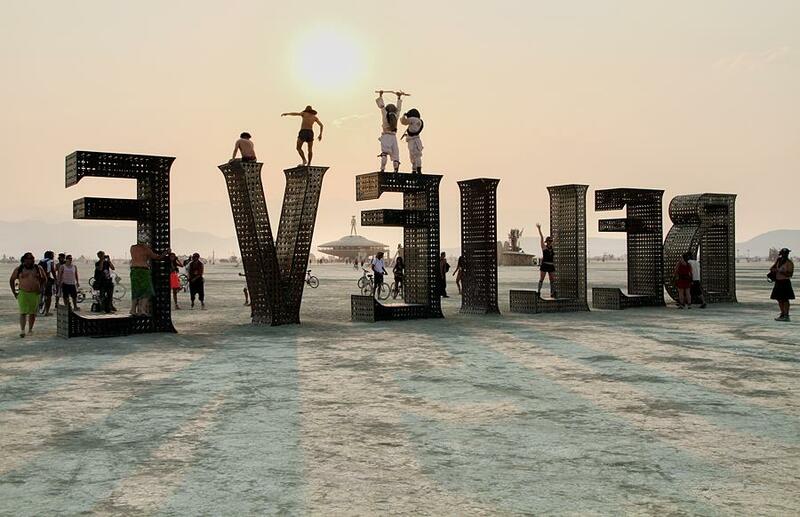 A group of folks pooled their resources and spent a few years building it, and brought it to Burning Man so people could dance on top of the coolest thing they’ll ever dance on. 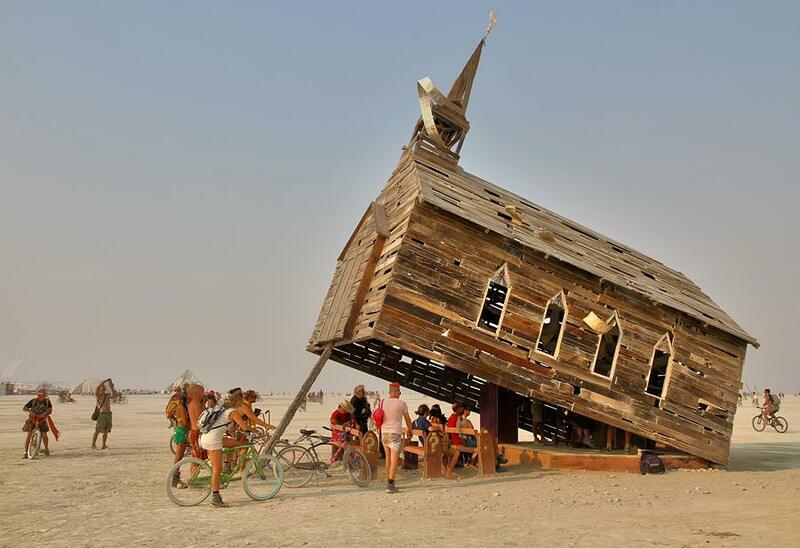 Will it ever come back to Burning Man? I guess you’ll have to go to find out. For those who aren’t familiar with steam punk, a good way to describe it is how folks in the 1800s would have envisioned futuristic technology. Think Sherlock Holmes making sci-fi. The use of low-tech, age-old technology to make something futuristic, but with antique aesthetic. It’s a very popular style at Burning Man, both for art and for costumes. But what of The Man? After all, the event is named after him. Who is he? And why is he burned? Does he represent man’s ego, which must be destroyed before he can truly see others? Does he represent corporate or government greed, and society’s thirst for anarchy? Does he represent masculinity, trying to dominate his realm while subconsciously furious that only woman can create life? Is he an idol, to be worshiped as a god, and then destroyed to liberate mankind from religion? 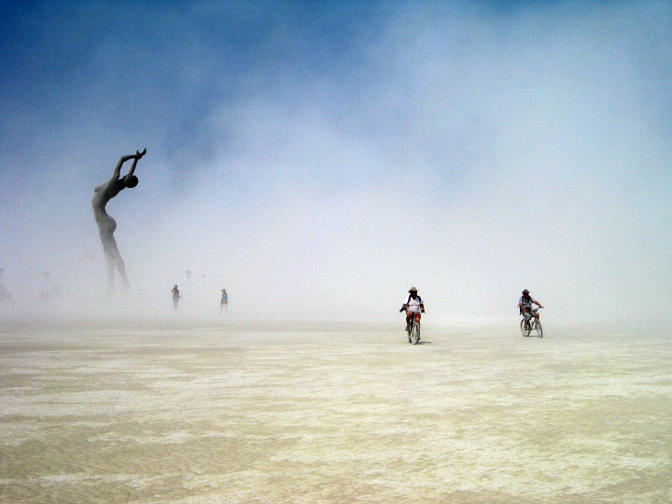 There are as many theories as there are people who’ve heard of Burning Man. None of them are correct. And all of them are correct. The Man is whoever or whatever you want him to be. Only one thing is certain. On Saturday night, he will burn. The Man himself is the same every year, though the base he stands on is different. This year, he perched atop a janky wooden UFO, in keeping with the theme “Cargo Cult.” When Allied forces landed on remote Pacific islands during the second World War, the primitive communist cultures there thought they were gods from the heavens, and were in awe of all the “cargo” they carried with them. After the departure of military forces, some members of these cultures formed “cargo cults” and built crude sculptures with whatever they could find to represent the space ships (airplanes) and weapons of the gods. They changed from a civilization with no private property or goods to becoming fiercely selfish…attaining as much “cargo” for themselves as they could. 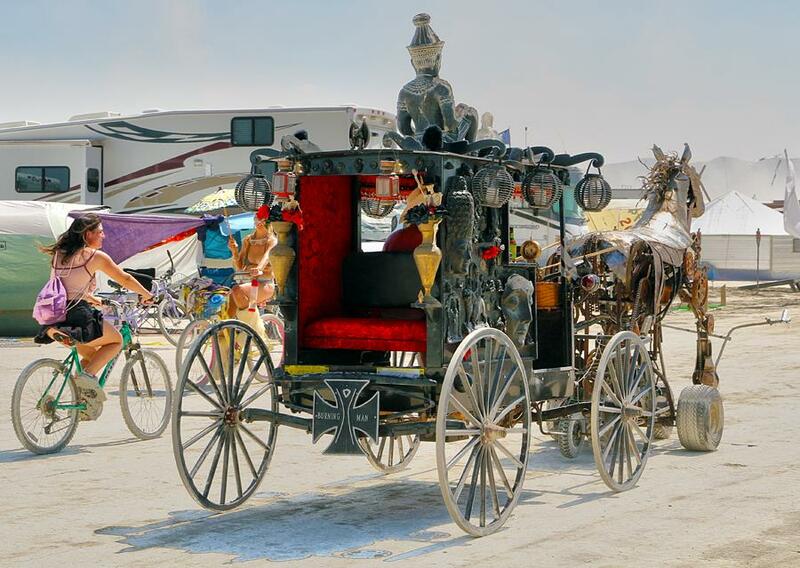 So this year’s Burning Man theme explores how much “cargo” we covet in our modern culture, as opposed to how much we truly need to be happy and fulfilled. Communist? Perhaps. Burning Man is a supremely communist event. Money is not allowed in the city. Everything is free…from meals at restaurants to drinks at bars to…God in Heaven Above forgive us for this Greatest of all Sins…free health care. 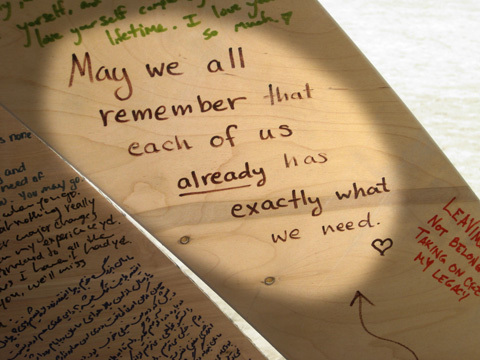 Everyone is expected to contribute what they have to the community. If you’re a dot-com millionaire, maybe that’s a big dance club, a restaurant, a medical tent, sponsoring artists or gifting tickets to those who can’t afford them, or simply helicoptering in to the city to serve grilled cheese sandwiches for a day, as Facebook founder Mark Zuckerberg did this year. If you’re a broke barista, but great at massage, maybe that means you hang out on the corner a few hours a day and gift foot massages to tired Burners who’ve walked 20 miles that day. Somehow or other…it all works. Which brings me to The Temple. 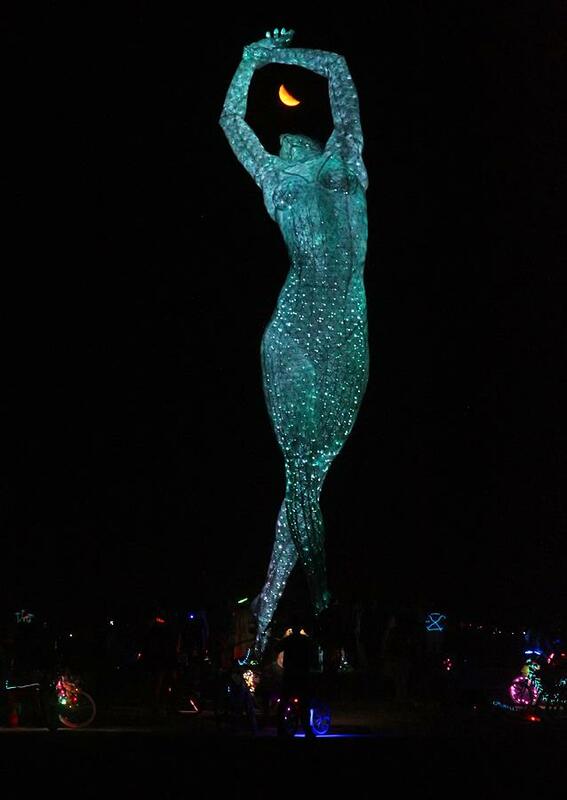 My favorite part of Burning Man. Each year, a different organization is given the responsibility to build The Temple. They do it with no help from the organization that plans Burning Man. The community contributes the funds to build it. And each year, it is stunning. This year, the team that built The Temple did so with no mechanical fasteners whatsoever. No nails or screws. Not even wood glue. Each joint in this massive structure was cut precisely to fit. …a feat of craftsmanship that is RARELY seen in this era. Again, every last second of time was volunteered. Every last penny was given by the community. It was a truly a masterpiece of blood, sweat, and tears. This year, it was called The Temple of Whollyness…dedicated, of course, to the desire that each person feel whole, and the desire that eventually all humans will realize we come from one place, we have the same needs, hopes, and dreams, and we are all part of one whole. The Temple isn’t a particularly religious place, though it is always the most sacred, spiritual place I’ve ever stood. Yes…many, many people pray there. Not always to the Judeo-Christian god, of course, as Burners come from all over the world and embrace many faiths. 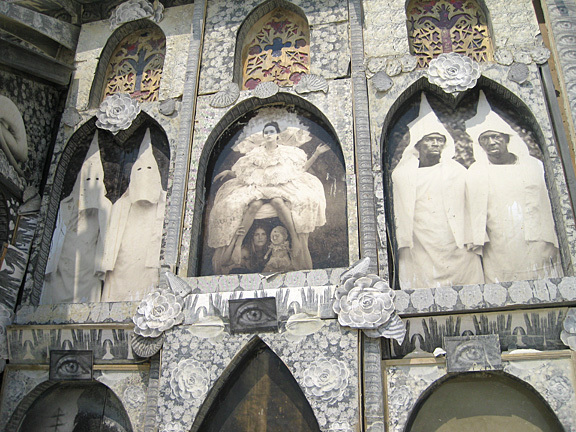 But The Temple is a place to witness and celebrate surviving the human experience. People come here to purge…to cast off their regrets and fears, to confess, to celebrate and be thankful. And unlike the burning of The Man, which is celebratory and primal, The Temple is burned in complete silence, with only the sound of weeping and praying in the occasional lull between the roar and heat of the flames. Afterward, there is catharsis. People walk as close to the fire as possible, baptized by the searing heat. Some hold hands and sing songs. Spirituals, mostly. But sacred songs in many languages rise into the night sky. 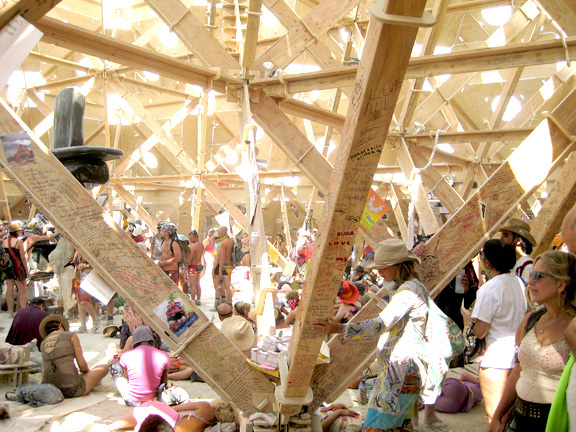 So while people love to place Burning Man in all sorts of boxes, for me, The Temple sums it up. It’s a place where people come once a year to belong to a family that accepts and loves EVERYONE, regardless of who they are and what they believe. Unfortunately, churches have yet to perfectly provide that. Families have yet to perfectly provide that. 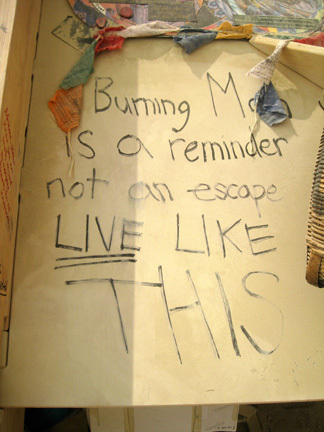 But Burning Man has figured it out. Somehow. To finish, enjoy 7 minutes of my annual video on The Temple. Don’t watch this with anyone else around. Close the door. Turn off the phone and the TV. Let these words of anguish and triumph, doubt and joy sink into your soul. You’ve felt this way before. We all have. So none of us is alone. We are all part of one human family. It begins. My annual pilgrimage to Burning Man. 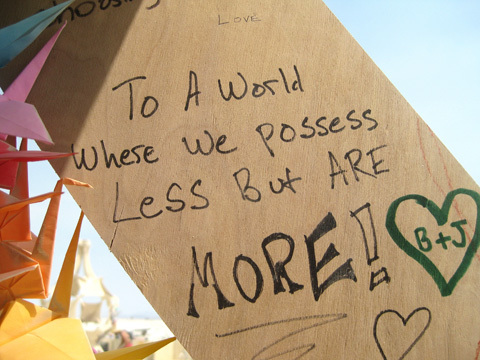 I’ll explain more about Burning Man in a later blog, because right now, it’s about the journey there. And boy, was I ready to be on the road. 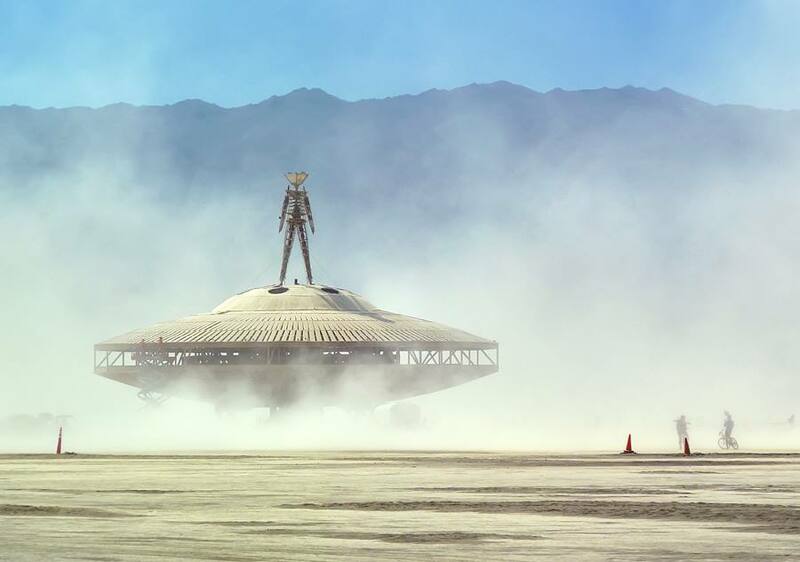 The last month has been nothing but frantic preparation for Burning Man. Way more than normal. In the past month, I built a 750watt solar array to power our camp, converted a big chest freezer into a refrigerator to run off the solar array, made a burn barrel by carving our camp name “Pot Luck” into the side of a 55 gallon steel barrel and welded cast iron skillets onto the bottom as creative feet, bought a rusty used trailer on Craigslist and rehabilitated it (so that I could carry all this stuff, which collectively weighs over 1,000 pounds), plus cooked a week’s worth of food for 35 people. So, as you can imagine…I’m a little tired. My buddy Ross is with me. 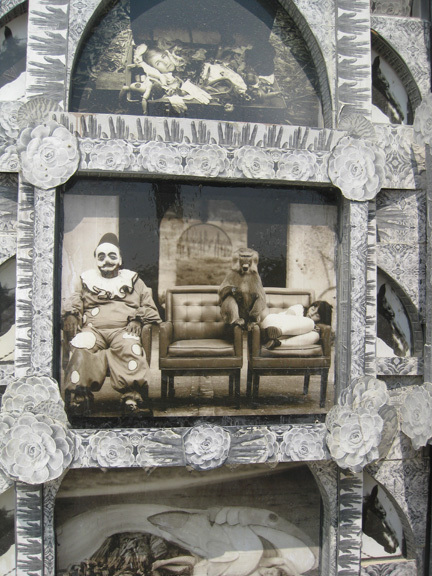 Ross was on my very first trip to Burning Man. While this year marks my 5th burn, Ross is returning for his 2nd. And we hit the road yesterday, very nervous about this ageing rusty trailer and my little Pontiac Vibe’s ability to haul it all the way to remote northern Nevada. 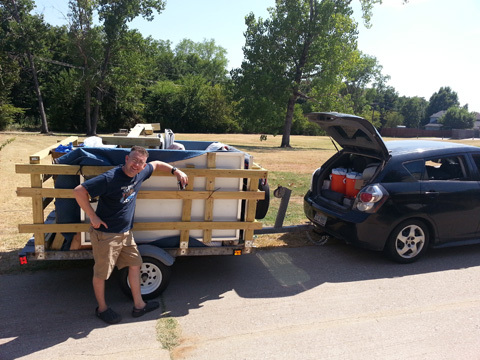 The drive yesterday was uneventful, across north Texas. But as soon as we hit the border with New Mexico, the world changes. In my mind, I’m thinking, “So I suppose that when Jesus turned the water into wine, it must have been alcohol free wine?” But I don’t say it. The poor clerk didn’t make the rules, and he’s probably sick and tired of explaining a hundred times a day why they don’t sell beer. But I have always found it bizarre when some Christian denominations stigmatize alcohol, when others, like the Catholics, tend to keep the alcohol business in business. Wine is mentioned far more often in the Bible than water. Back on I-40, we pass the tiny village of San Jon. Somehow, its population of about 300 hardy souls keeps alive a 24-hour Indian restaurant. ?? 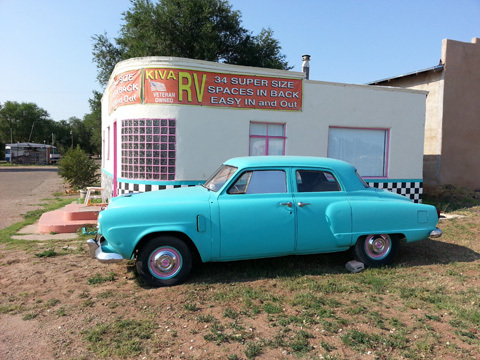 We stop for the night in Tucumcari. I’ve driven past the Tucumcari exit a thousand times since I was a kid. I was always puzzled by the big highway signs announcing that the town has 35 hotels, 40 restaurants, etc, when it’s barely a blip on the map. 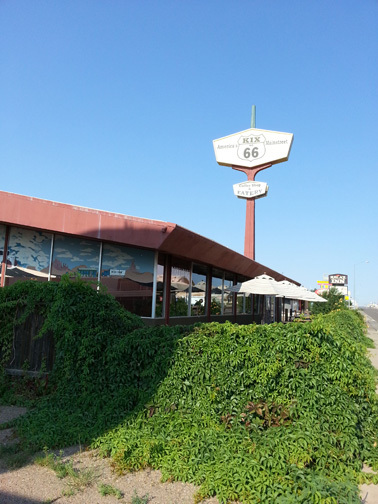 Turns out Tucumcari is ideally located on the historic Route 66 between Chicago and Los Angeles, where many travelers would just be reaching this spot near dark. So this unassuming village blossomed into an overnight stop on America’s greatest road trip, and the town is still full of vintage architecture and it’s downright charming. Take this hotel, for instance. If this 1950’s wonder, fully restored to its chic heyday splendor, was sitting on South Congress street in Austin, it would be $400 a night, booked a year out. But here in Tucumcari, it’s just another $30 a night hotel. “What do you think about this place?” he asks. “Well, it needs a bit of work,” I say. We part ways with a friendly handshake, and duck into the hotel’s espresso bar. 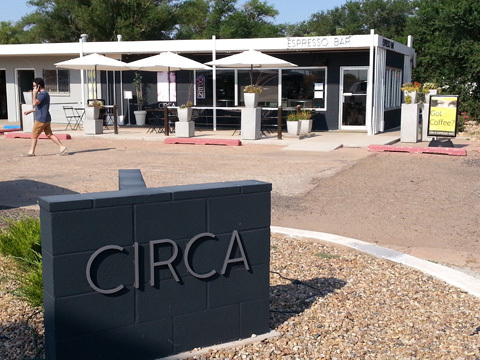 As I thumb through the pages of a history book on Tucumcari, the delightful girl behind the counter whips us up an Atomic Espresso milkshake. We have 3 choices: the White Sands (white chocolate), the Trinity (dark chocolate), and the B2, which has 4 shots of espresso, coconut, pineapple, and caramel. She says the B2 is her favorite, so we get that, even though it sounds somewhat bizarre. Turns out, coffee caramel pina colada is astonishingly delicious! Like…really, really good. As we walk out of the coffee shop exclaiming our astonishment, we pass a drainage ditch overgrown with Johnson grass, and in the ditch is a man on a horse. He waves at us and notices the slightly surprised look on our faces, and he explains why he and the horse are in a ditch. “The horse is scared of lions,” he says. Well, that’s understandable. So am I. But no time to get down in the ditch and hide from the lions, because the Blue Hole beckons us westward. The town of Santa Rosa has advertised this 80-foot deep artesian spring of ice-cold, crystal clear water to parched desert travelers for over a century, and while I’ve read about it plenty of times, I’ve never stopped to take a dip. No time like the present! 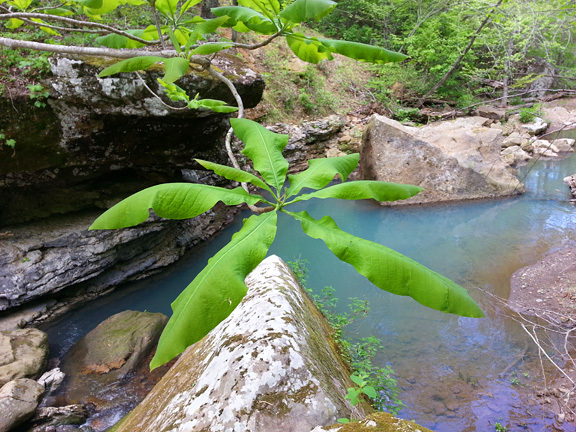 The Blue Hole is a really cool place to stop if you’re traveling along I-40 in this part of the world. It’s in a city park and it’s totally free to swim there. And they actually encourage you to jump off the cliffs into the water…a rarity these days. Just be aware that the water is REALLY REALLY COLD! 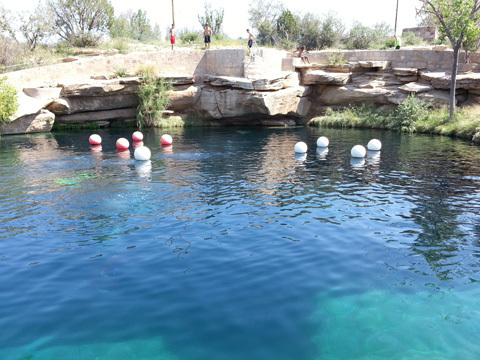 And watch for SCUBA divers when you leap in…this is a popular place to get open water certified because of the depth and clarity. 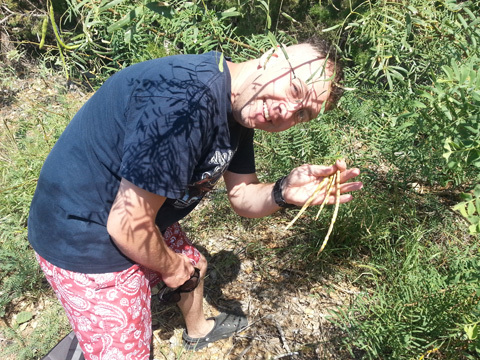 After a chilly swim, we forage some mesquite beans from the trees near the hole. Mesquite trees produce beans that are filled with a sweet, sticky paste and it was an important staple for Native Americans. Ross and I are going to infuse a nice Scotch with the mesquite beans and some charred mesquite wood as a Burning Man experiment. I’ll let you know how it turns out. Back on the road we stop at a few of the cheesy truck stops that sell southwestern trinkets and local cherry cider (YUM!) and FIREWORKS! It’s legal in New Mexico to sell fireworks year-round, and some of these truck stops have even professional-grade fireworks. It’s pretty crazy! I am always stunned as the massive San Francisco peaks rise out of the northern Arizona desert, signaling the arrival into Flagstaff, one of my favorite cities in the world. If you’ve never been to Flagstaff, you owe yourself a trip. It regularly appears on the “Best Cities to Live In” for lots of reasons. It only has about 60,000 residents, but the food and microbrew scene is truly world class, it has superb schools and an excellent university, it sits at 7,000 feet above sea level, so summers are incredibly mild (it was 68 degrees when we arrived on August 18 at sunset, and got down into the low 50s that night) and winters can be chilly but with only occasional snow…have I convinced you yet? How about that it’s about an hour’s drive to the Grand Canyon? Or that the charming downtown nestles around a historic train depot and is full of independent shops, galleries, cafes, and breweries? Flagstaff is a model of what the American local economy should be like. 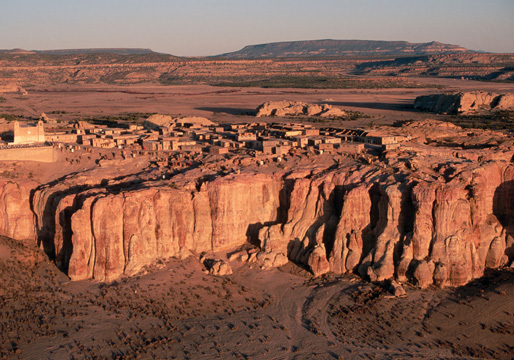 It’s a small town that feels like a big city, in the middle of the most scenic wilderness in the world. And it always smells like pine trees. I absolutely love it. Tomorrow, a whirlwind trip to the Grand Canyon before heading further west toward Burning Man!